All integrated delivery networks (IDNs) face the same cost pressures: of managing rising healthcare costs without negatively affecting patient care. In 2013, a regional health system in the South was specifically challenged to reduce its spending by $100 million over four years. 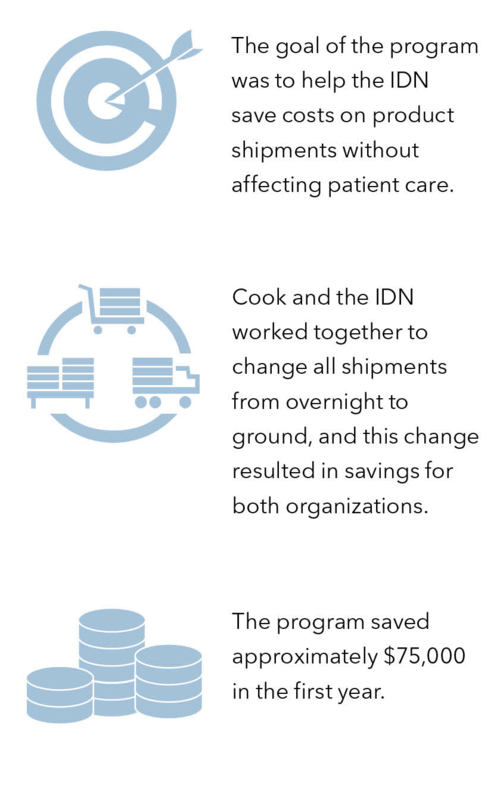 The IDN recognized that a huge opportunity to cut costs was in the supply chain, and the IDN began investigating the way products move from vendors to patients. One of the areas that the IDN looked into was shipping costs. If, for example, a product is shipped from a nearby city, then there is no need to order priority shipping, because the product would arrive soon enough via standard ground shipment. However, looking at shipments one by one wasn’t enough. The IDN needed the help of a vendor that was willing to think creatively. Cook Medical had a long-standing relationship with the health system—on the clinical side and the business side. The director of the centralized services center and Cook’s corporate account executive worked together during a series of face-to-face meetings to discuss shipping and quickly realized that they could achieve cost savings on both sides of the table by changing the shipping paradigm. Cook has historically guaranteed overnight shipping at no cost to the customer on all orders over $200. The director of the centralized services center pointed out that the free shipping allowed their procurement department to order inefficiently, because they didn’t have to plan ahead. Since the products were being shipped from nearby, in Indiana, and ground shipping typically guaranteed delivery within two or three days, there wasn’t much of a need for overnight shipping. The vast majority of products are not needed the day after they’re ordered, so both organizations agreed to change all of their transactions to ground shipping. Cook and the health system also share the goal of maintaining the quality of healthcare. A supply chain transition such as this ideally should be invisible to the IDN’s customers. The right product should still be available at the right time for patients. Luckily, a system was in place to plan for standard ground shipping with other suppliers, so there were no obstacles to making the change. As of January 1, 2014, all of the IDN’s orders from Cook have arrived via ground shipping. Shipping costs have been reduced by 87 percent. Estimated savings for the year are approximately $75,000. Cook and the IDN both credit the success of the program to a shared willingness to be transparent and sympathetic to the other’s needs. The organizations are talking about other supply chain projects that could also lower costs. For more information, or to arrange an appointment with one of our Healthcare Business Solutions team members, please e-mail us at orders@cookmedical.com.